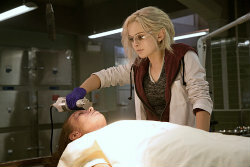 IZOMBIE’s Liv found herself in a rough spot when season 1 ended. With many of those closest to her now in on Liv’s zombie secret (including Liv’s ex-fiance, Major, and Liv’s roommate/BFF Peyton), some of the weight has been taken off of her shoulders. Of course, Liv’s family still doesn’t know the truth…and the season concluded with Liv being asked to donate blood to her wounded brother. But since Liv used the zombie cure on Blaine and a briefly-zombied Major, she’s fresh out of the cure and ideas of what to do. IZOMBIE season 2 premieres Tuesday, October 6th at 9 PM on The CW.